I miss my NPR content! Three times a year for about 2 weeks each almost all programming is kidnapped by WAMC while they try to raise money for the station. I am used to being annoyed with public radio pledge drives in the past, but the stations I used to listen to would at least give you some content with 15 minute pledge breaks scattered throughout the day. Alas, at WAMC the content for these weeks is replaced by rote repetition of their phone number (1-800-323-9262, by the way), while pleading to save the station. Perhaps I’m making too much of the pledge drive. With most stations streaming content online, I replace my WAMC morning feed with either WNYC or KQED while I get ready for work. It’s really only during my short commute to work that I need to do without…something that I do during the summer months anyway because I drop the car for a bike. If I were being untrue to myself, I would say that I’m sticking up for those who have much longer commutes, but in truth, I desperately miss Paul Caiano’s 7 minute weather forecast. He’s taught us so much. How many of you knew where Eureka, Nunavut Territory, Canada was before listening to him? I’m convinced that location is only included to make us feel better about having lows below 0F. WAMC has greatly improved the pledge drive experience by shortening it with the lock box, a term that always reminds me of Al Gore’s Social Security saving plan (SNL skit). But we could make this even better by having a pledge-free stream for those of us who donate to the station. KQED does this, so I know it can be done. I guess I’ll just have to live with the occasional pledge-drive inconvenience (WAMC does need to raise money somehow, of course) while stressing over whether or not I should also donate to the alternative pledge drive stations that provide a semblance of normalcy during pledge weeks. It’s time to pay the ransom so WAMC will give back our NPR content! After all, in this drive we’re so close and it’s only day 3! There’s been much hype, and post hype criticism of the handling of the snow storm this week. My friend from the area says he uses a factor of 3 (not of the American Pie variety) to estimate the quantity of snow we will receive. Take the forecast, he says, and divide by 3. Not only was it a great place to ski, but it’s close, free, and has some great tiered hills which looked great for sledding. 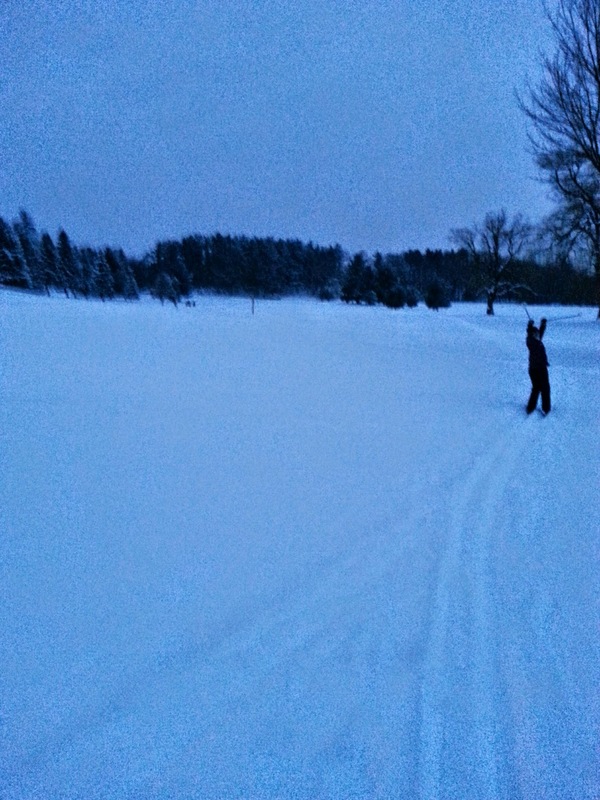 Most of the locals I speak with talk about Dead Man’s Hill in Central Park, which is a great large hill, but I think it will be even more fun to sled in the golf course, and I’ll give it a shot the next time I get a chance. An Alaskan town is in danger of destruction by a mystical snow globe that appears on a family’s doorstep, wrapped like a Christmas gift, and causes deadly “natural” disasters in the real world, while simultaneously occurring in the globe. Are you ready to travel back to the 90s? I’m not talking about Portland. A city known for its historical scientific progress has brought about something that’s currently only available in science fiction. It’s possible right here in Schenectady to travel back in time. In fact, the city of Schenectady is so generous, even you can be transported. It’s really simple. Just type in www.cityofschenectady.com into your browser, and you can revel in the glories of busy, hard-to-read websites that are as difficult to navigate as they are informative. The clip art traffic light gif is especially nice on the metrics page. It’s time for a facelift. The city should ditch the various PDFs and make the site cleaner with easier navigation. City employees’ emails, not just their phone numbers, should be listed so they can be contacted when it’s convenient for the resident outside of working hours, and more forms and information should be made electronic. As much as I love playing phone tag with the wrong person, I’m confident that they have enough to do besides call me back. And that’s the crux of it. An easier to use website will not only help improve civic engagement, but it will help improve employee productivity. Now that’s tax dollars well spent. I think Winter is one of the scariest words in English. At least, it must be based on the reactions people have when I tell them I moved here from out of state. It doesn’t really matter where I came from. After an incredulous reaction to this information and the inevitable “why?”, the follow-up questions usually involve my ability to handle Winter and snow. I think most people in the Capital Region suffer from the-grass-is-always-greener syndrome. It does get cold here…we have a wind chill advisory tonight (-25 F ! ), but I don’t find it to be too much of a burden to add on an extra layer. By now, I’ve learned how to handle a pair of gloves, hat, and scarf. I’ve even gotten long underwear for those times when it’s necessary to be outside for an extended period of time. But most days, it’s not such a big deal. Even snow, which must be the second scariest word, is fairly easy to handle. I’m just hoping it stays cold enough so we don’t have that awful slush we got to start the year. I actually find it very peaceful to shovel snow in the late evening or early morning when few people are out and the snow pack reflects the faint glow of moonlight. It’s a nice outdoor exercise. But the one thing no one ever seems to mention with respect to Winter is the dry skin. I guess it should be obvious that extended periods of time below freezing will result in low humidity, but I struggle trying to apply enough lotion to keep my knuckles from cracking and bleeding. It certainly doesn’t help that I am constantly washing my hands throughout the day, which just washes away the lotion I actually managed to remember to apply. I guess my New Year’s Resolution should be to apply lotion every night and morning to help prevent the inevitable cracked skin. Maybe I’m just not using the right type of lotion? If I can make it through Winter without bleeding knuckles, I’ll be very happy indeed. Here’s to a healthy-skin New Year! A: Can you believe it was 110 F in Las Vegas today? B: That’s high, but it’s also a dry heat, so it doesn’t feel as hot . A: True, but it’s still very hot. To help resolve these comparisons, we use the heat index, which accounts for the relative humidity and temperature. At the other end, we have the wind chill, which predicts how cold you will feel by using wind speed and temperature. The key thing that comes out of each of these estimations is an adjusted temperature that accounts for the wind speed or humidity to give you a real-feel temperature. I think these approximations are a great way to easily convey many pieces of information into a single number. So what does this have to do with snow? Well, perhaps it’s because I’m a relative novice to the whole concept of shoveling sidewalks, but what I want to know when it’s going to snow is not how many inches of snow I will receive, but the amount of time and effort it will take me to clean my driveway and sidewalk before I need to head to work. Unfortunately, inches (or feet if you are in Buffalo) is not an effective measure because snow can be light and fluffy or heavy, wet snow. I haven’t survived too many winters, yet, but it’s clear to me that the heavier snows are much more difficult to clear. The relevant metric should not be inches of snow, but mass of snow. (It’s at this point that we could consider a more complicated formula with wind speed, to account for snow drifts in this driveway-clearing snow metric). Getting everyone to refer to snowfall by mass is a loser’s battle, just look at how difficult it is to get Americans to use metric units. So, I propose a snowfall index similar in nature to the heat index or wind chill in that the snow total is adjusted by the density of the snow to give a real-feel snowfall total. We already have tabulated the snow density based on the temperature, so it’s really a mater of combining the temperature at which the snow falls with the total inches in a meaningful way. I will start by picking a reference temperature of 10 F. This temperature will be used to provide a mass equivalence for the snow index. Using 10F as a baseline, I used the liquid equivalent to determine a snow index factor to multiply any snowfall total. Actual snowfall is in inches and T is in degrees F. It may be aggressive to use the equivalent density to adjust the snowfall totals. After all, 3 inches of snowfall at 32F would give a snowfall index value of 9 inches, which may be a little extreme, but snowfall totals are in desperate need of a wind chill equivalent, and this is my first stab at it. So, will it actually take me 3x longer to clear snow at 32F than 10F? I doubt it, but this winter, I will put it to the test. It’s time for the annual Concerned for the Hungry Thanksgiving Food Baskets. They are looking for volunteers to sort food, pack boxes, and deliver food to families starting next Wed, 19 Nov. Check out their website for more information. It’s a little hard to find, so I copied it at the end too. Every day I am constantly shocked by the level of poverty in Schenectady. Food security is one of those topics that shouldn’t be an issue in the US, yet it is such a problem in Schenectady that when free breakfasts and lunches were provided to all students, attendance jumped by 38% in the high school and 50% in the middle school. Almost 43% of those who responded to the UMatter Health survey last year are using SNAP, and I see food stamps used at the grocery store every time I go. The food insecurity contrasts with the proliferation of a food culture where people like Michael Pollan suggest food “rules” without consideration for price. Yelp abounds with reviews of restaurants, cool new food trucks, and gourmet culture. Even Price Chopper, the only grocery in Schenectady, will be changing its name to Market 32 to better appeal to the gourmet crowd. I should note here, that I generally agree with the criticism that the true cost of much of the cheap food is being felt in other ways, e.g., polluted waterways. I also love good food, so I struggle with how to rectify the juxtaposition of high food culture with urban poverty. I don’t expect I’ll be able to change agricultural policy or any of the other structural issues that result in the largest level of inequality in the developed world; but what I can do is support the efforts of organizations, such as Concerned for the Hungry, that focus on alleviating the food needs of Schenectadians throughout the year. I hope you can join me in volunteering next week, and if it doesn’t work in your schedule (we’re all busy, right? ), then I hope you can consider supporting efforts to meet the immediate local food needs. Volunteers are needed for the 2014 Thanksgiving Food Drive!! All are welcome on the following dates/times. ** Individuals do not need to sign up to volunteer. Simply come to the school at indicated dates/times. ***Groups of 10 or more, please send us an email indicating the date and timeframe you would like to volunteer. Is East Ramapo Central School District the Future of NY Schools? Ever since I listened to the This American Life story about East Ramapo Central School District (A Not-So-Simple Majority #534), I have been wrestling with what this situation means for other school districts throughout the state. I think it’s important to note that much of what is reported to have happened by This American Life and other sources is extremely disturbing. The actions reveal a violation of the social contract and a level of disdain for the public by a government body that is extremely troubling. And yet, I couldn’t help but think that a larger structural impact is at work that threatens to make the budget cuts of East Ramapo the leading edge of a tidal wave of school budget pressures across NY. While East Ramapo is an extreme case, school districts across the state will begin to face additional budget pressure because of a confluence of an aging population, rising taxes, and loss of middle class jobs. For those who aren’t familiar with East Ramapo’s story, I’ll summarize it briefly here (you should really listen to TAL or read one of the many articles about the district). Essentially, a large orthodox Jewish community who does not send their kids to public school decided to fill the school board with their candidates and reduce the budget to reduce taxes, cutting programs along the way. I am not going to describe in detail my initial caveats of the board’s unsavory actions. Some more numbers. During the last 10 years, every comparable school district in the county grew its budget by an average of 50%. East Ramapo’s budget grew by 33%. Which, to a layperson, you might say, well, oh, the budget grew. How bad could that be? I actually kind of thought that, at first. But I talked to school administrators and experts who said that the costs the Hasidim and other conservatives say are out of control actually are rising alarmingly fast– pensions, health care, union contracts, cost of living. Those things grow by so much that a 30-some percent budget increase, that isn’t growth. That’s devastation. This quote captures my concern that East Ramapo is just the tip of the iceberg. Over the last 10 years, we’ve seen the largest recession since the Great Depression, a large increase in unemployment, and a significant loss in home values which, coincidentally, are taxed to support the schools. Yet, the costs that are out of control “are rising alarmingly fast.” Needless to say, the current rate of growth in education spending is unsustainable in the current system. I’ve written before how school districts in NY create a structure that exacerbates social inequality, and I question the ability of a school district like Schenectady to continue to fund the budgetary growth in a community with so many children qualifying for free and reduced lunch that free food is provided to all students. The rising costs are leading to social friction. In this last year’s budget discussion, the district held a series of meetings to get community input on where to cut to meet the $10MMUSD shortfall. One of the options was to eliminate a pay raise for staff. At my table, not only was this option emphatically supported, but it was coupled with resentment, anger, and in one case resignation that it wouldn’t happen because of the strength of the unions. Is this a prelude of an East Ramapo revolt? 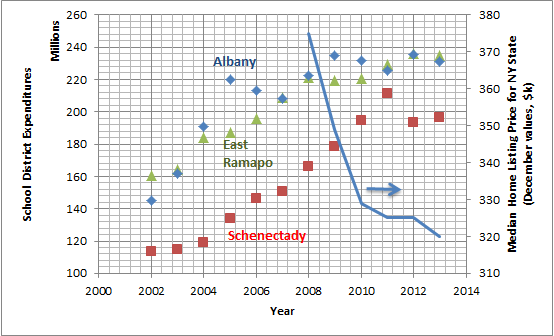 A couple of things to note: East Ramapo has similar expenditures (even per pupil) as Albany, and all districts have been increasing spending dramatically over the last 10 years despite a dramatic downturn in 2008. The typical caveats to the data apply, but it’s clear that unless district expenditures fall in line with broader economic growth, rightly or wrongly the extremism that happened in East Ramapo will appear in other districts, especially given the loss in the tax base. It doesn’t have to. While set against a Jewish-Secular divide, the tragedy about East Ramapo is that the current students suffer because of unsustainable expenses that resulted in a tax payer revolt. To prevent this situation from occurring elsewhere in NY, schools should be funded by a large tax base, e.g. the state, to ensure that teachers and education staff can be paid competitively in districts, such as Schenectady, where more than 50% of students live below the poverty line. As anyone who’s been paying attention knows, the Schenectady School District is underfunded by the state by 46%. But costs need to be brought in line as well. NY state pays teachers more than any other state according to the National Center for Education Statistics, so pay and benefits should reflect market forces and cost of living. I’m not suggesting that the pay for a teacher match the median income because that would hurt poorer districts, but failure to normalize public employee salaries with private sector realities breads the sort of radical actions seen in East Ramapo. The Daily Gazette has a good article from 2012 that summaries the teacher salaries for districts in the Capital Region. Finally, school districts need to do a better job of reaching out to those who do not have ties to the school. As the average age for starting a family increases and the population as a whole ages out of schools, districts will have to work even harder to convince voters in NY to approve tax increases. I want to see a larger presence for the students in the community. Have displays at Proctors of student art, give public performances at neighborhood meetings, and/or incorporate positive community projects into the curriculum and improve the city while teaching students. School districts across NY state are on an unsustainable budgetary path. Unless district leaders, politicians, union leaders, and the public make compromises, the drastic cuts to school programs seen at East Ramapo will become more common; we all, not just future generations, will be worse off because of it. 12309 NA, Eastern Ave NA, Central State St NA Meetings April 23, 2019 at 6:30 pm – 8:30 pm Robb Auditorium, Ellis Hospital McClellan Campus The monthly neighborhood association meetings for 12309, Eastern Ave, and Central State neighborhoods. Don’t just eat… on Restaurant diversity, anyone?